We know the drill now, President Obama comes out for something and Republicans fall all over themselves supporting the contrary. The only problem is when Obama comes out for something that’s for all of the public’s good, then we get to watch the spectacle of Republicans cheerleading against that. In his pre-Superbowl tv interview yesterday, President Obama expressed the importance of parents getting their children vaccinated especially in light of the recent outbreak of measles around the country. So? When Obama says “Stopping outbreaks of diseases is good!”, what do we expect to hear from a Republican? Specifically, Chris Christie? Really? Government has to decide between having a national epidemic and letting ‘Mericans have the freedom to cause epidemics? Because that’s what The Founders had in mind when they wrote the Bill of Rights? To be fair, maybe there are two things at play here, aside from Christie lobbying the pro-measles voters out there. First and foremost, it’s about opposing anything Obama says, next it’s about constructing the phony “Evil Big Government is always trying to stomp on your rights” and maybe lastly it’s about appealing to the GOP base that doesn’t believe in science and may believe the BS spilling out of the anti-vaccination Luddites (it fits in as a new trifecta with the contrail mind control gas and 9/11 false flag crowd). It seems quite sad that the GOP has been reduced to a “know nothing” party that celebrates its stubborn ignorance on Climate Change, medicine, birth certificates, facts, etc.. In Christie’s attempt to pander to the “You’ll have to pry the polio from my cold dead hands” crowd, he also reveals the cognitive dissonance that is so pervasive in Republican politicians. Seems like the most contagious diseases in the GOP that are no vaccines for, are ignorance and cynical pandering. And the fact that your kids are all spotty! Once again Ad, you beat TDS to the punch! TDS?Not sure what that is, KT. It’s The Daily Show, with Jon Stewart. 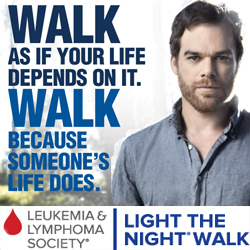 Thanks, I don’t get it here because I can’t stay up that late. Y’know, When I Was A Kid (and yes I hear the irony in that phrase), ignorance and stupidity were considered by the Public to be a disease and it was our duty as Americans to wipe them out. But it seems that the Great Minds of the Republican Party have decided that Stupidity can also be a Choice, and they choose it again and again. With all this talk about anti-vaccinations and anti-cleanliness, I’ve thought of a great way to find out if the Republicans really believe what they are saying. Next time you meet a republican, hold him down and piss on him. See if he objects. Ad, I can’t help it, I still want to piss on a republican. But I’m seeking help. Awesome, AdLib! 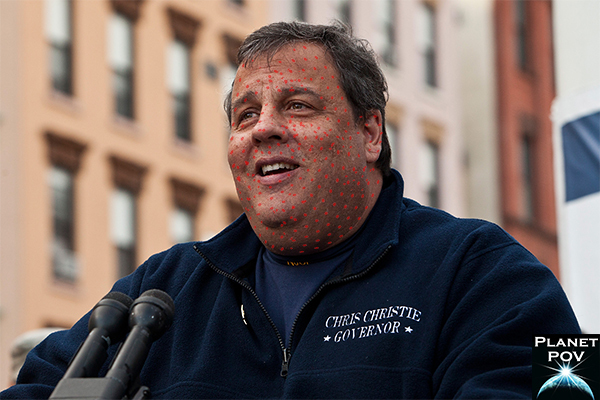 I was really impressed by those realistic-looking measles on Christie’s face in the graphic too! 😆 I always love the graphics you come up with. The Dumb-U-Down 3000 is really going to get a workout over the next year or so. Joni Ernst alone could blow several dozen fuses and circuit breakers. Please don’t forget to have it towed in for it’s 100,000 mile checkup when it’s due. As for Christie. I can’t wait for Jeb’s people to dig up those old videos of him hugging the President and being all bi-partisanishy after Super storm Sandy. It’s gonna be an interesting campaign. Thanks Kes, glad you liked the measles I gave Christie…see how he likes people not taking vaccines now! I will be keeping the Dumb-U-Down 3000 in top condition for the very reasons you list! Glad I bought the extra warranty! KT -- Even if you could, these Stupid would resist being fixed because it involves science. Hey Ad, how goes it? Well, that is a prime example of one of the reasons why stupid cannot be fixed. Ignorance can be alleviated by education. Stupid, on the other hand, allows no room for education (science included). It’s a real cognitive Catch-22. A pediatrician blasts Christie and tears him a new one. Rightly so. He’s done and said some dumb things, but this must be the dumbest considering that measles, German measles, can be very dangerous for pregnant women. One question, is that Christie or a giant balloon in the Macy’s Thanksgiving Day Parade? Kalima, can’t get more of a slapdown than that! Hard to believe that we’ve reached this point in Republican blindly-hateful anti-science where the RW lemmings are throwing their children into a measles epidemic for political reasons! In the name of personal freedom against the evil government? Who’s evil, the government vaccinating children or parents needing to believe that their children are better off contracting Republican endorsed measles than federal government vaccinations? When I was a child, vaccinations were compulsory and we got most of them at school. Tillis is the guy who beat Kay Hagen. He is a carpetbagger. From Tenn. Now in NC. I guess NC is happy with him. Crazy as it is, he must have had backing from some rich guys (Koch maybe). I’ll ask why he wants to regulate resturants to put signs up saying their workers don’t have to wash their hands , but not to make them wash hands? This guy is an idiot! It figures that he is a republican. It doesn’t matter what Obama wants the GOPers are going to take the opposit opinion! Maybe Obama should say lets keep the minimum wage down, lower taxes on the rich, and stop listening to scientists. Nirek, you’ve got a point there, maybe Obama needs to try reverse psychology and say he’s for everything the Repubs support then they’ll pass bills opposed to that and he can “give in” and sign them!